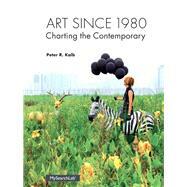 Art Since 1980: Charting the Contemporary presents a chronological survey from the late 20th century into the early 21st century. This title is built around short discussions on individual artists. Author Peter Kalb maintains a balance between a social history of institutions and contexts, and attention to individual aesthetic choices. Works cited come from these fields: painting, photography, and sculpture, plus installation, performance, and video art. Peter R. Kalb is the Cynthia L. and Theodore S. Berenson Professor of Contemporary Art at Brandeis University where he teaches modern and contemporary art history. Before preparing Art Since 1980 he was the revising author of the Fifth Edition of H.H. Arnason History of Modern Art and the author of High Drama: The New York Cityscapes of Georgia O’Keeffe and Margaret Bourke-White. His scholarship addresses issues in twentieth- and twenty-first-century art and criticism and he serves as the Boston-based corresponding editor for Art in America. Youth Culture as a Measure of Global Change?